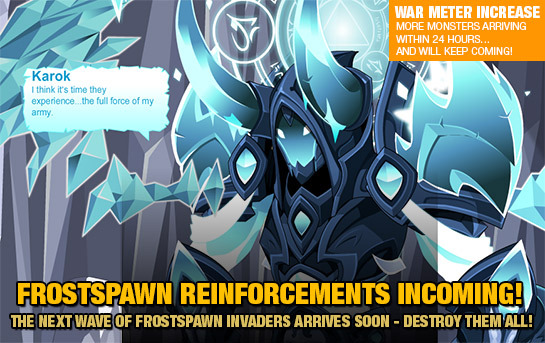 You got the war meter to 25%... but now Karok's reinforcements are on the way! Congratulations! You took out the FIRST wave of Karok's Horde much easier than he expected! (We knew you could do it!) But now... oh now! Revenge is best served cold, and that's EXACTLY what he's planning to do! If you've watched the 3rd cutscene* you know that Karok is about to throw MORE monsters at you and Cryostorm Village! But we have confidence in you, Heroes! Every few hours, more monsters will be added to the war meter, and you'll soon see some unfriendly new faces joining the Horde in /cryowar. He's going to make you FIGHT for your victory... for REAL! Karok is NOT playing around -- he's out to destroy you, Frostval, AND find the Champion of Ice before the Queen of Monsters recalls him. 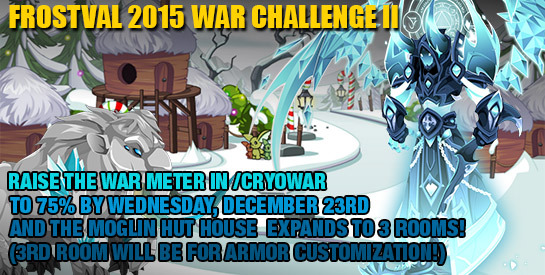 Frostval 2015 War Challenge... Part 2! You BLASTED through the FIRST war challenge and unlocked the 2 room house for free! If you can get the war meter to 75% by Wednesday, you'll unlock an additional room WITH Armor Customization on the Moglin Hut House for free! * Rejoin /cryowar (or re-log in) to see it in all its ice-cold glory!